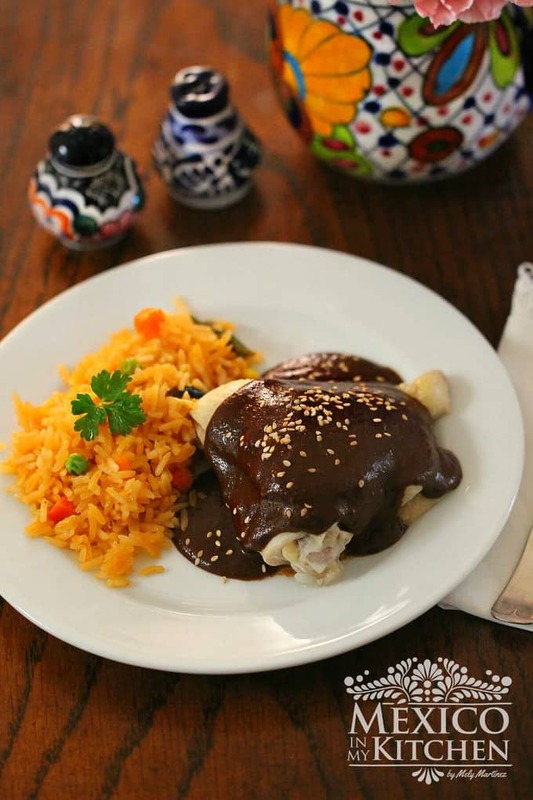 An “enchilada” is a rolled tortilla with filling inside covered with a spicy sauce. 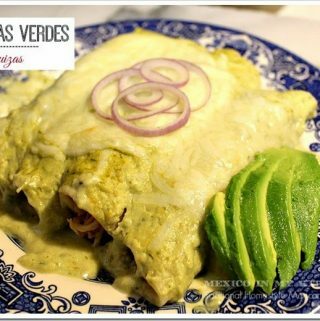 Green Enchiladas can be filled with a variety of ingredients, including beans, vegetables, cheese, meat, seafood or combinations. The difference between Swiss Green Enchiladas and the rest of enchilada recipes is that these are topped with a cream sauce and Swiss cheese and then baked. Enchiladas can be made ahead of time, covered tightly, and then stored in your refrigerator for a couple of days until you’re ready to bake them. The ones in the picture were prepared on Sunday and baked until Wednesday. 2. Heat a skillet over medium heat; warm oil and dip the tortillas one at a time into the oil to soften, giving it just a few seconds per side. Besides softening them for easy rolling, another of the reasons that we do this is to avoid the tortillas from breaking. I prefer to brush the tortillas and then warm them in a skillet to use less oil. Transfer onto a plate covered with paper towels to drain any excess oil. Preheat oven to 350°F. 3. Season the chicken with salt and pepper. You can also add garlic powder if you like. 4. Fill the center of each tortilla with the chicken and roll it up. 5. Spread 1/3 Salsa verde in a 9″ baking dish. 7. Cover with the rest of sauce; sprinkle with cheese. Bake 30 minutes or until cheese starts to brown. Serve immediately. The difference between Swiss Green Enchiladas and the rest of enchilada recipes is that these are topped with a cream sauce and Swiss cheese and then baked. Enchiladas can be made ahead of time, covered tightly, and then stored in your refrigerator for a couple of days until you’re ready to bake them. Place Salsa verde, Mexican Cream and cilantro in a blender, process until you have a smooth sauce. Set aside. Heat a skillet over medium heat; warm oil and dip the tortillas one at a time into the oil to soften, giving it just a few seconds per side. Besides softening them for easy rolling, another of the reasons that we do this is to avoid the tortillas from breaking. I prefer to brush the tortillas and then warm them in a skillet to use less oil. Transfer onto a plate covered with paper towels to drain any excess oil. Preheat oven to 350°F. Season the chicken with salt and pepper. You can also add garlic powder if you like. Fill the center of each tortilla with the chicken and roll it up. Spread 1/3 sauce in a 9″ baking dish. Divide shredded chicken evenly among tortillas, roll them up, and arrange the enchiladas in 1 layer, seam side down. Did you like the recipe? Please let me know in the comments section, do you have questions, or share the link with your friends. I hope you have an incredible time cooking! Mely Martinez, the cook at Mexico in my Kitchen! So, so good. I made these last night with your salsa verde recipe. I usually need to add a bit more jalapeño and threw two into the pot to boil with the tomatillos. They had to be the hottest chiles I've had in a long time. I was coughing and sneezing as they boiled and turned on the vent and opened a window. I'm glad I had the foresight to only throw one in the blender before tasting! Wow! SO HOT. The salsa didn't need a second. I wasn't sure whether to cut and seed the chiles before cooking so I did. The sauce was delicious, the enchiladas incredible. For my own taste, I will use more salsa before baking as a lot absorbed before serving. Thank you for your recipes! I love your blog. I made enchiladas suizas for Christmas brunch. I did tweak slightly, I use Hatch chilis and make mine stacked with chicken. The tomatillos give such a great flavor! Using this version for my suizas from now on, thanks Mely. Hi meli I have tried a few of your recipes & they did not disappoint😋I am wanting to make these but there is not a link that I see for your salsa verde recipe.I was wondering if you could tell me how you make it?Tia & I look forward to making these!! Thank you Meli for getting me a quick response!I tried them for dinner tonight & they were delicious!! !